How do you get the most results from your content marketing? With a killer content marketing strategy. Of course, in a real-time world, it can be hard to plan ahead. When news stories break or a product launch gets postponed, you have to adapt your content while keeping your long-term goals in mind. And no matter what you publish, you also have to keep everyone from your sales team to your social following happy. It often feels like you’re serving two masters—or five or six. But with the right planning, you can create a long-term strategy that saves your energy and your sanity. 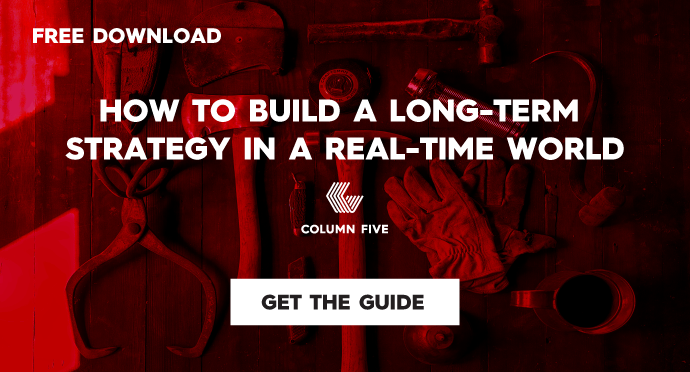 Check out the e-book, and let us know your tips for creating a content strategy. NEED HELP WITH YOUR CONTENT STRATEGY OR CONTENT CREATION? LET’S CHAT. I get the following error when trying to access the ebook: The HubSpot account associated with the domain “content.columnfivemedia.com” has expired.